Sake House is one of the most loved sushi restaurants in the Southern Suburbs but there are people on the planet who don’t eat sushi, like me! Can’t stand the stuff! But that doesn’t hold me back from being social and visiting the restaurant for a toot should some friends be indulging in the fishy side of life. 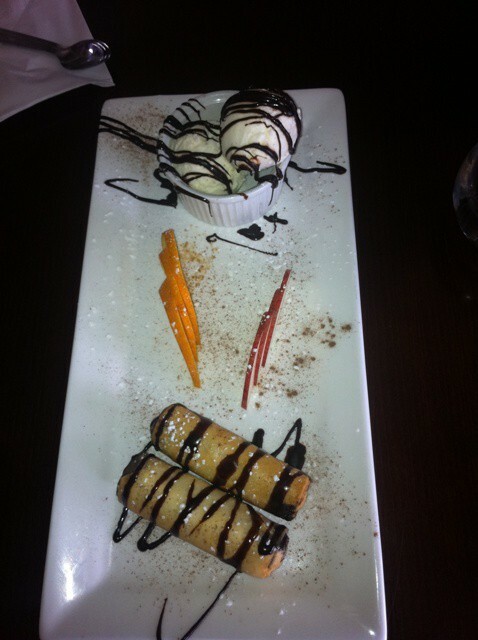 Whilst on one of these said visits, I discovered THE MOST DIVINE banana chocolate spring rolls EVER! It has to be said that I’m also not MAD about bananas, except if cooked, but these spring rolls are literally to die for! I’ve forced a few people to try them out and they have been just as blown away as I have! So whether you love sushi or not, love bananas or not, just give these bad boys a go, they truly are out of this world! Previous articleLunch @ Die Dam Huis, Melkbos, 20.08.11.